In a landmark study, researchers have linked elevated blood-serum iron levels with shorter end caps (telomeres) on chromosomes. Shorter telomere length is associated with increased incidence of age-related disease and mortality. 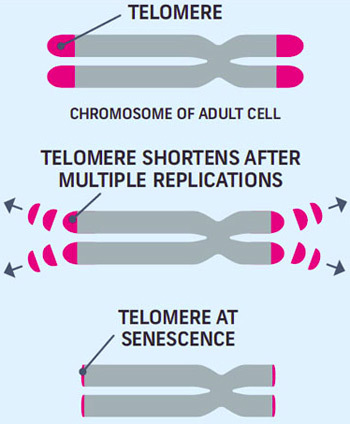 Telomere length has emerged as a marker for biological aging and is associated with shorter lifespan. The results of this study may also help explain why telomere length is determined by gender as women have lower iron levels throughout most of life due to menstrual losses and are reported to have longer telomeres and a longer lifespan than males. This study also points to interventions such as blood-letting and dietary avoidance of iron-rich foods to maintain telomeres and prolong human lifespan. Other studies point to women who use multivitamins having longer telomeres than women who don’t take multivitamins. Given that elevated iron levels, below true clinical iron overload, is associated with greater morbidity and mortality and shortened telomeres suggests iron may not just affect a minority of iron-overloaded adults but actually be a more pervasive influence over human lifespan. The current recommendation for daily iron intake from the diet and supplements was established to prevent anemia with no consideration of excessive iron’s effect on telomeres. Telomere length and elevated iron: The influence of phenotype and HFE genotype. Department of Family Medicine, Medical University of South Carolina. Elevated body iron stores are associated with morbidity and mortality due to oxidative stress. Hereditary hemochromatosis, a common condition caused by HFE gene mutations, can lead to excess iron storage and disease but clinical penetrance of HFE gene mutations is low and many people with elevated iron stores lack HFE mutations. We analyzed data from the Hemochromatosis and Iron Overload Screening (HEIRS) Study to assess the relationship between HFE genotype (individuals with either homozygous or compound heterozygous status for C282Y and/or H63D HFE mutations were defined as genotype positive, or G+), elevated iron phenotype (individuals exceeding gender-specific transferrin saturation and serum ferritin threshold levels were considered phenotype positive, or P+), and leukocyte telomere length, a marker of biological aging and cumulative oxidative stress. In unadjusted analyses in comparison to individuals who were G-P-, G+P- were not significantly different (OR 0.74; 95% CI 0.26-2.04), while the G+P+ (OR 2.03; 95% CI 1.15-3.56), and G-P+ (OR 2.24; 95% CI 1.5-3.29) had increased risk of short telomeres (<=25th percentile) rather than long telomeres (>=75th percentile). In analyses adjusting for age, gender and race/ethnicity, the effect of individuals with elevated iron phenotypes having short telomeres persisted with G+P+ individuals (OR 1.94; 95% CI 1.02-3.72), and G-P+ individuals (OR 2.17; 95% CI 1.39-3.39) being significantly different from the G-P- group. In conclusion, elevated iron phenotype, but not HFE genotype, was associated with shortened telomeres. Further studies will be needed to determine if telomere length provides a marker for morbidities specifically associated with iron overload. Am. J. Hematology., 2013. © 2013 Wiley Periodicals, Inc.